We have a number of items available that will give a lovely ambiance to your next outdoor soirée. One of our newer products, which we’re really excited about, is this Mason jar string light set. These would look so great along a window or around the edge of a porch, don’t you think? I keep picturing all the colorful shapes and shadows they would cast on the ground after the sun goes down. Since there’s not always an outlet nearby, you could also consider the option of candles to give your outdoor gatherings a nice glow. We carry several different styles of tea light holders, so you can pick the perfect one to blend with your decor, or you can mix and match if you’ve got a more eclectic style. If you’re not big on the idea of actual candles, you can try some LED tealights to get the same look without having to worry about keeping the flames lit on a breezy evening. If candles aren’t your thing, we also have multiple styles of solar lights. Leave them out during the day to charge up in the sunlight, and once it gets dark enough, they’ll start coming on automatically. We just added some new styles and sizes, so you can use single bulb or strand lights, or even flickering multi-color ones, depending on the vibe of the party. One of the toughest things about keeping guests comfortable outside can be keeping the bugs away. Our antiqued oil lamp / tiki torch lid can convert your jars into citronella lamps. You just add some citronella oil, screw on the lid, and light the wick. Set them up in areas where people are congregating, and away go those annoying mosquitoes. Since your guests won’t be busy swatting away bugs, they’ll have their hands free for drinks. You can serve them in style with one of our stylish jar caddies. They’ll help you carry out up to 6 at a time as you’re making the rounds serving up lemonade, iced tea, or your signature cocktails. The faster you get people served, the more time you have to spend with your friends enjoying the evening! Okay, maybe that’s enough daydreaming about parties for today. If there’s anything special you’re looking forward to when spring hits (especially if it involves your jars!) let us know in the comment section. We are absolutely in love with these measuring cups. Stacked together, they resemble a beautiful pale blue jar, but the segments pull apart into 4 pieces for 1/4, 1/3, 1/2, and 1 cup measurements. It’s a really attractive set you’ll be happy to have out on the counter, which means your measuring cups will always be at hand when you need them! 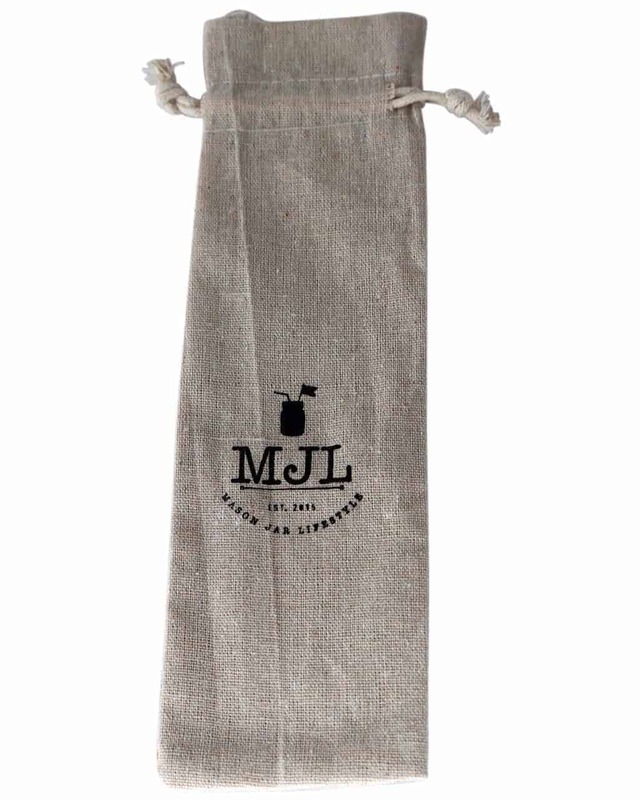 In addition to our regular straw sleeves made from reclaimed denim, we now have straw pouches with a cinch top, perfect for keeping your straws organized in a drawer and for having them clean and ready-to-go if you stick them in a purse or backpack. The outside is stamped with the Mason Jar Lifestyle logo. Frog lids are so useful and versatile, aren’t they? We wanted to add a few colors and sizes to give you more decorating options. They are now available in shiny copper or your choice of three different antique finishes–rust brown, oil-rubbed bronze, or galvanized metal. The rust brown, galvanzied metal, and copper lids are available in both regular and wide mouth sizes, so those of you with wide mouth jars who’ve been waiting on frogs lids can finally get to decorating! We added 5 new finishes for the canister lids with handles; check out all the different styles that are now available here. Additionally, the flat-top decorative lids now come in 4-packs of shiny copper or antique pewter, whitewash, or barn roof zinc finish options. We’re always amazed by the cool ways people find to decorate or organize using our products, so if you’ve got some photos of yours in action, send them our way. We’d love to see ’em! Also, let us know what you think of the new items and if there was anything else you were hoping to see on the list but didn’t. Our customers always have such great ideas for us, and we appreciate your input! Well hello there! Long time no see. Here we are in late February, the dregs of winter. March 1st is considered “meteorological spring” and March 20th (the vernal equinox this year) is “astronomical spring.” That means we’ve either got about one week or one month left of winter, depending on which one you consider the “real” transition. I’ve decided to go with the former, since it seems more optimistic…although I’ll really know that spring has sprung when those cute little crocus flowers start peeking their colorful heads out of the ground! Some of you are probably fortunate enough to live in places that don’t get hit very hard by winter. For the rest of use who are still trudging through snow and scraping ice off our car windshields day after day, waiting impatiently for green grass and warm sunshine to come back into our lives, this seemed like it might be a good time for a pick-me-up. A little sunshine in a can, as they say…or, in this case, a jar. (‘Cause that’s how we roll here.) Here are three fun Mason jar mood boosters to get you through a gloomy day. This one was a given, right? There are few things more lovely and cheerful than fresh flowers. Pick up a bouquet of some of your favorite blooms, and arrange them in a Mason jar. You can use a frog lid to hold the stems in place and add a rope handle if you want to hang it somewhere. Display it someplace where you’ll see it often throughout the day. Even if it’s grey and gloomy outside, it’ll feel like springtime in your home! Birds, the harbingers of spring. Bring ’em on! The seasonal birds will start showing up soon, so you’ll want to be ready for them. Many stores sell seed mixes that are designed to attract specific species of birds. (I’ve tried using different ones, and they actually work!) If you like the idea of waking up to the sounds of songbirds, hang a bird feeder near your window and fill it with their favorite seed mix, then get ready for the music. If you’re feeling ambitious, you can convert a standard Mason Jar into a cute bird feeder using a dispenser base and some strong twine, or you can try our all-in-one hanging Mason jar bird feeder. It’s ready to go–you just add the bird seed! There you have it! Three of our favorite Mason jar mood boosters. What are some of yours? We’d love to hear about them! The end of the year is fast approaching, and so are the office parties, family get-togethers, and, of course, gift exchanges! It’s such an exiting and joyful time of year, but sometimes it can be stressful trying to come up with just the right gifts for all the people you care about. Mason Jar Lifestyle is here to help! We’ve curated 5 unique gift sets based on different interests…AND, to top it off, we’re offering a 20% discount on all of them from now until Tuesday! Each set will also include a holiday card. You can fill it out yourself, or, if the package is being mailed directly to the gift recipient, we can fill out the card for you with a custom, handwritten message of your choosing–just include your message in the “order notes” section when you’re checking out. Note: Other than the cocktail shaker/jar combo, these gift sets do not include the jars. Since our jar prices are set based on the fact that glass is fragile and heavy (and therefore more costly for us to ship), we understand that ordering jars through our website is not always the most cost-effective option for our customers. We wanted to leave you the option of purchasing your jars separately, from whatever source you prefer. Also, we know that many of you will be gifting to people that you may happen to know have shelves already overflowing with jars (it’s just possible we happen to know a few homes like that ourselves…), so we didn’t want jars to be a required part of the purchase. If you do want to add jars to your order, though, we would of course be happy to oblige! After the description of each set, we included the number and size/style of jars that are recommended to go with them. Happy shopping! Do you know someone that loves sauerkraut or homemade pickles? How about kimchi or kombucha? This kit will allow the recipient to create their own fermented products in small batches, right in their own kitchen! Fermented foods are awesome for gut health and loaded with probiotics, so this collection would be a great gift for a health nut in your life as well. The set includes two of our specially-designed silicone airlock lids with stainless-steel bands. Also included are two glass weights for holding fermenting foods submerged in liquid, where they can safely ferment in an anaerobic environment. To top things off, we added one of our favorite recipe books for at-home fermentation; it can help beginners get started or provide new recipe ideas to the more experienced fermenters. You know those friends that spend hours on Pinterest, finding all the best DIY projects to add a personal touch to their homes and their gifts? This is the right set for them. The gingham lid inserts turn any regular mouth jar into a pin cushion (great for sewing needles as well), and the inside of the jar can be used to store thread, buttons, or whatever little crafting odds-and-ends a person happens to have around–it turns clutter into adorable home decor! Our string dispenser lid is a cute yet practical way to store twine for craft projects and gift wrapping. The medium-sized Mason jar stamp works great for homemade cards, gift tags, or jar labels, since it has a spot in the middle of the design that’s perfect a small note or message. The Mod Podge jar paint is specially designed for colorizing glass while still leaving it transparent, and we know it’ll be a hit, since it turns any ordinary jar into a real show piece. We’ve also included a book of craft ideas/instructions for using Mason jars in tons of exciting and attractive craft projects. Who doesn’t love a well-crafted cocktail? In this set, we’ve combined our popular stainless steel cocktail shakers lids with some neat accessories. It comes with 4 short, glass straws to use in place of those little disposable drink straws–a way to help the environment and look classy doing it! Our double-sided cocktail spoon/fork is great for stirring drinks or spearing olives for martinis, and it’s long enough to reach all the way to the bottom of a quart jar. To top things of, we included a drink recipe book with 125(!) different cocktails perfect for serving in Mason jars. This is just right gift set for someone who loves adding unique little touches to their home decor. The rustic, wire caddy fits 3 pint jars, so we chose 3 lids to go with it: 2 cork lids and one frog lid. The cork lids fit into the neck of a jar (no ring/band required), and the jar can be filled with all sorts of things, depending on where you want to put it: snacks, like candy or nuts; decorative items, like colorful marbles or seashells; or household items, like cotton balls. The frog lid turns a jar into a perfect vase for flower arrangements, since it holds the stems right in place. If fresh flowers aren’t their thing, frog lids can also hold decorative branches or dried herbs, like lavender, or they can even be used for more practical purposes, like holding pens/pencils or small paintbrushes. To expand on the Mason jar decorating theme, we also included a magnetic Mason jar note pad (great for the fridge) and a teal print Mason jar tea towel. You know we had to include this one! Even with all of the inventive ways that people have found to use Mason jars over the years, sometimes you have to get back to basics. We wanted a canning/jarring set that would work for newbies as well as seasoned veterans in the art of preserving food. If you know someone that always seems to have vegetables leftover from their garden every year but hasn’t tried canning yet, this would be a great way to get them started. The Taste of Home collection has 201 recipes, plus all sort of helpful instructions and tricks of the trade. This gift set also includes a 4-piece utensil set to make sanitizing tools and filling jars so much easier. (You’d be surprised how many long-time canners I’ve seen fumbling with regular kitchen tongs as they try to lift jars out of scalding hot water, or spilling all over the place as they try to pour hot liquids without a good funnel. Sometimes people just need a friendly nudge in the right direction!) Also included are 12 vinyl chalkboard labels, which can be wiped off and rewritten as needed, along with a “liquid chalk” pen that’s easy to use and writes better than standard chalk. In addition, there is a 3-pack of brightly-colored, reusable silicone jar toppers, which make jars or preserves look especially nice on display or can add a special touch when gifting jars of homemade preserves to others. And a little more good news: In addition to all of these new gift sets we put together, we’ve also decided to extend the Holiday Coffee “Give Twice” Gift Set availability through Tuesday. That is the final day the set will be available on our site, since all the coffee for those orders will be roasted fresh on Wednesday. Get your order in now while there’s still time! Since 100% of the profits for the coffee are going to support the small farm in Nigeria, that set is not part of the 20% off sale. Christmas is less than three weeks away! If you’re like me, you sometimes struggle with finding meaningful AND unique gifts. Mason Jar Lifestyle to the rescue! It doesn’t get much more unique than Mason jar accessories (and who doesn’t love Mason jars??). But here comes the best part: we are proudly partnering with charitable Houston-based coffee company From the Grounds Up to make your gifts extra meaningful. From the Grounds Up roasts premium coffee, with 100% of profits benefiting a farm in Jos, Nigeria. Contributions provide crops, seeds for the tree farm, farm animals, and all that’s needed to support their agriculture needs. Each coffee bag is stamped with what is currently being purchased for the farm! We’ve put together a perfect gift set, which includes a wide mouth pint Mason jar, a faux leather sleeve, a silicone coffee lid, a stainless steel band, and a bag of this premium coffee. Each set includes a holiday card with a note detailing the positive impact of your purchase. When you purchase and give this gift set, you’re really giving two gifts – one to the gift recipient, and one to the farmers in need! Because each bag is freshly hand roasted in small batches, this set will be offered for a limited time – through December 10th only – for Christmas gift giving, so please act quickly! The set is available here. If you would like us to write a custom note on the card for you (if you’re sending it directly to the gift recipient), please indicate in the order notes what you would like the card to say. Seasons greetings, friends. If you’re reading this, then it looks like you survived the big weekend of holiday shopping. Congrats! Whether you braved Black Friday crowds, supported the “little guy” on Small Business Saturday, or shopped from home in your PJs on Cyber Monday (or maybe all three! ), we hope you found some great deals and some fun gifts for your loved ones. Thank you so much to all of you who chose us for your shopping needs and visited our website to take part in our storewide #THANKFUL sale over the holiday weekend. We truly appreciate your business, your feedback, and all of your support! If anyone is kicking themselves for missing out on our sale this past weekend and would like advanced notice for the next one, now would be a great time to sign up for our newsletter! (A little elf told me there might be another special event during the month of December…) We send out email updates to let you know about things like giveaways and upcoming sales, as well as updates on new products we’ve added. You’ll even receive a 10% off coupon just for signing up. As many of you probably know, today is Giving Tuesday, a day when people across the country donate to their favorite charities. At Mason Jar Lifestyle, we love collaborating with non-profits to support worthy causes. For a list of some of the groups we’ve worked with in the past, check out our Giving Back page. We’re always taking requests, with special consideration given to organizations in Colorado, especially the Denver area. One of our company’s first donations was to Forgotten Felines Rescue. They have a network of foster parents that care for cats and kittens and help get them socialized for their “forever homes.” This is a picture of Barney (adopted from FFR) befriending his new family. He was immediately very sweet and loving with all the tiny humans in his life, due to the devoted care he received in his foster home, and he’s now a cherished member of the MJL household. Because this organization does such great work, we were happy to hear from them later when they had a donation request, and we jumped at the chance to give back. For those of you planning to make a donation today (or anytime, really), there is a fantastic website available to make the decision a little easier and make sure your financial contributions are being used as effectively as possible. The site is Charity Navigator, and they provide ratings and detailed information for almost every charity group that files their information with the IRS. It’s an amazing tool for choosing non-profits, to help you make sure you donate to the ones that use as much money as they can directly toward supporting their causes. We’d love to hear about some of your favorite charities. Leave us a comment to let us know which groups are at the top of your list and what it is you love about them. We’re Maggie and Ryan, and we loved Mason jars long before our business, Mason Jar Lifestyle, was even a twinkle in our eyes. When our youngest child was two-months-old, I (Maggie) was shopping at a local big box store and came upon a display of Mason jar drinking lids and soap pumps next to the jars. I immediately put one of each in my cart but wished there were more options than just those two items. I wondered what other clever attachments were out there, and I knew I wasn’t the only one. Fast forward a few months, full of research and planning, to the launch of masonjarlifestyle.com – a dream come true for Mason jar lovers, who, like us, wanted to make the most of their jars. Did we mention that we also had a two-year-old and four-year-old child at home (in addition to our baby!)? It was a wonderful, whirlwind of a time. I recall taking product photos with baby sleeping peacefully (and, let’s be honest, often also crying and fussing), strapped to me in his carrier. We did everything, from web design to shipping, from a small office in our home. After just a few months, though, we had outgrown our small home office and began searching for, and soon relocated into, an offsite space. We also hired two awesome family friends to assist with shipping and a part-time nanny to help with our kiddos. Since we launched our business in May 2015, we have grown into a larger operation than we ever imagined, while continuing to value quality and customer service, just as we always have. We now have five amazing employees. All seven (Ryan and me + employees) of us are totally committed to giving our customers the very best experience possible. Each order still includes a handwritten note. Every email receives a response directly from either Ryan or me. If you want to see a product that we don’t yet carry, we want to hear from you. We have an active social media community on Facebook and Instagram, where we often post ideas, sales, giveaways, and other fun content. We also value giving back to the community with regular donations to charities and charity events. We will never forget where we came from or why we’re here. It’s for the love of jars, and it’s because of you. Hello, all. This is “Mason Jar Middle Sis” here (MJMS, if you’re in a rush), embarking on my first blog post for Mason Jar Lifestyle. Thanks for joining me on this journey! A couple of weeks ago, my husband came home from the grocery store with an apple cake mix that he thought I might like. (Awwww.) The back of the box had instructions to turn the ingredients into a salted caramel apple crisp, which I thought I might like even more. I gathered my ingredients and peeled and sliced several apples only to discover, after opening the box, that the caramel sauce was not included. Shoot! After digging through the fridge and confirming that we didn’t have any on hand, then digging through the pantry and confirming that the caramels we’d gotten “for Halloween” had all disappeared well before Halloween, I decided to make caramel sauce using ingredients we already had, which were sugar, butter, vanilla, and a can of sweetened condensed milk. I’d never made caramel with condensed milk before; luckily, it turned out great! (Scroll down for the full recipe.) While it was still warm and gooey, I drizzled some of it over the apple crisp. The rest went into a jar and into the fridge for later. I only made a half batch, since I wasn’t sure how it would turn out, but I’d recommend making a full batch if you do it yourself, since it’s easy to store and would be fun to share with people. I think this would make a great little gift for friends, so there’s really no reason to worry about making too much. You could bring a jar with you to share at Thanksgiving this year, or add a fun lid insert and a cute gift tag and give it as a holiday gift to anyone with a sweet tooth. It’s good with cake, ice cream, or even stirred into your hot cider or cocoa. To turn this into a tasty treat to-go, you can put some sliced apples into a jar and a couple spoonfuls of caramel into one of our divider cups, then pop on a lid and you’re all set. Now if you’ll excuse me, I have some delicious caramel apples to enjoy. Instructions: Add sugar and water together into a medium sized, heavy duty saucepan. Cook over medium-high heat, stirring occasionally, until it comes to a boil. Allow it to continue to boil, without stirring, for 10 to 14 minutes. It will slowly start to darken. Tilt the pan occasionally to redistributed the mixture and keep the cooking even until it turns a deep caramel color. Remove from heat. Stir in sweetened condensed milk. It will bubble up and expand a bit, which is why you need a medium pan to keep it from flowing over the edge. Do not scrape the sides of the pan during this stage. Add the first half of the stick of butter, one tablespoon at a time, thoroughly stirring after each piece. Stir in the remaining half stick of butter and vanilla extract until smooth. It will thicken as it cools. Comments Off on New Giveaway! Congrats to our most recent gift certificate winner, Jessica L.! Want a chance to win a $50 gift certificate to Mason Jar Lifestyle? Click the Rafflecopter widget below to enter! We have had such a great response to our recent giveaways that we thought, “Hey, let’s keep ’em coming!” Ladies and gentlemen, we introduce to you the Mason Jar Lifestyle monthly $50 giveaway! Enter through the rafflecopter widget below! Carolyn in Happy Earth Day! Jackie Melander in Nixtamalized Corn: Tasty and Healthy! janice mcwilliam in Beat the Winter Blues With a Hot Giveaway! Juan Benito in Beat the Winter Blues With a Hot Giveaway! Lynn in Beat the Winter Blues With a Hot Giveaway!